This is a serious parasitic disease in dogs caused by a parasite (microscopic protozoan) called Leishmania. The first most common clinical symptom is hair loss, especially around the eyes, ears and nose. As the disease progresses, the dog loses weight but not lose its appetite. Common signs are skin wounds, especially on the head and legs in the areas where the dog is in contact with the ground to lie down or sit. When the clinical profile is chronic, it becomes complicated by observing symptoms related to renal failure in many cases. 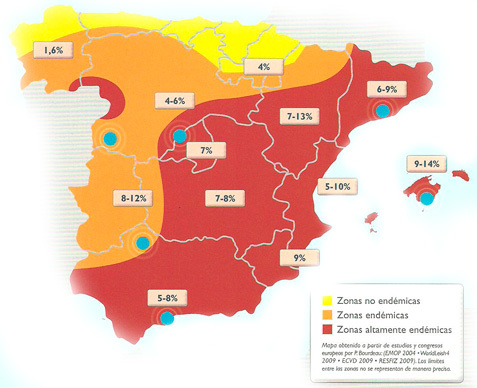 Where is leishmaniasis in Spain? In Spain the most affected regions are: Aragon, Catalonia, Madrid, Baleares, Valencia, Murcia, Andalusia, Castilla-La Mancha, Extremadura, Castilla y León. It is observed in other regions but with less intensity. What is the period of risk? Mosquito season begins with the hot weather, usually in May and ends in September or October if the summer continues. Mosquitoes remain during the winter in a state of quaternary larvae. In warmer areas of Spain mosquitoes are found almost all year. What is the risk of getting the disease? If your dog does not receive any protection, the risk varies from 3% to 18%. The risk increases if your dog always remains more in rural and peri-urban areas, in warmer regions of the country and if they are away from home at dusk. What types of leishmania are there? Together several different species of the genus Leishmania, Leishmania tropica, major, differ infantum. Within each species types are defined (“zymodemes”), which show minimal differences between them. What types of leishmania exist in Spain? In Spain there is only the Leishmania infantum. What is the life cycle of the parasite? 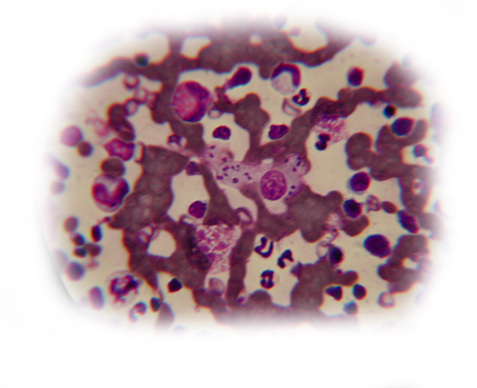 In dogs, the parasite lives in a special type of white blood cells (macrophages) from the blood, skin and internal organs, also found in bone marrow, joints and even in the Central Nervous System. When a mosquito (sandfly) bites an infected dog, takes parasites (leishmania) from the blood of its skin. In the mosquito’s stomach the infected cells rupture and parasites, which are released, change their shape and become elongated. These elongated shapes float in the stomach contents and adhere to the intestinal wall. They reproduce by binary fission, and in a few days, the mosquito’s stomach is full of parasites. When the female returns to bite, the parasites enter through the skin in dogs. 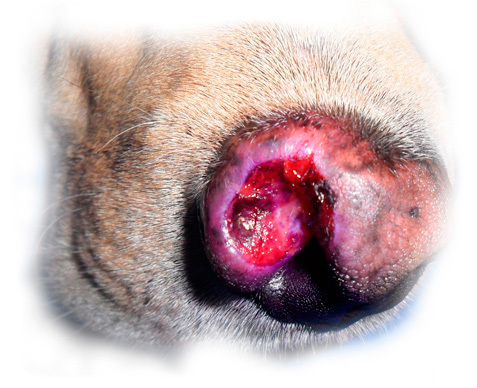 A tiny skin lesion (called inoculation chancre) at the point of pitting appears, usually in the nose or ear. There, the parasite colonizes macrophages and undergoes a morphological change to its original round shape. As the chancre disappears slowly, the parasites spread through the blood to other internal organs. 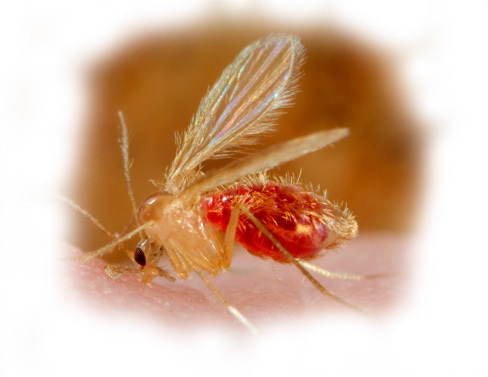 Leishmaniasis is transmitted only through a mosquito called phlebotomine sandfly. Do all sandflies transmit leishmaniasis? In Spain, more than a dozen species of sandflies among which two are defined only effective transmitting leishmaniasis (P. perniciosus and P. ariasi). Only the females of these sand flies transmit leishmaniasis. Why do only females transmit leishmaniasis? Because only females feed on blood. The female needs blood to produce eggs. About a week after a blood meal, females lay about 100 eggs on rich in organic matter and wet soil. Does the female spend his progeny infestation? No, each sandfly born free of Leishmania. How many times does the female have to sting to transmit leishmaniasis? To transmit leishmaniasis a female sandfly has to sting before an infected animal (so it infects) and then a healthy dog. When the female bites a second time, the parasites are deposited in the skin of the dog and infect the dog. Is the sandfly is the only way to transmit? In dogs is the only known form of transmission. In humans has been described cases of infected needles transmission (transmission of blood through blood). How can I recognize a sandfly mosquito? Sandflies are insects of small size (2.5-3 mm long) that, unlike other species of mosquitos, do not emit a buzzing sound when flying. The color ranges from light straw to dark brown. Mosquitoes cannot be seen during the day because they remain in cracks, voids and crevices. Mosquitoes that transmit leishmaniasis live on beaches but are most abundant in rural areas or cities in places with trees, such as gardens and parks. What is the life cycle of the sandfly? The larvae hatch from the eggs one week after the egg-laying. There are four larval stages before the pupa formation. Adults mature 10 days later. The entire cycle from egg to adult takes about 2 months. How often does a female need to sting? A female mosquito usually stings 3-4 times before they die. An infected female can spread to 2-3 dogs. What time of day does the sandfly bite? The cycle of mosquito activity begins at dusk and continues until dawn. Mosquitoes prefer the warm Mediterranean nights (not less than 16 ° C) and, due to their small size, cannot fly in strong winds (greater than 1 m / sec). However, they can travel long distances (up to 2 km). Does the sandfly also come into the house? Mostly, more of them bite outside, but there are also frequently inside the houses. They look for food thanks to the smell of blood of the animal that comes to them through the airflows. Then fly against these currents to settle and biting. What should I do if I think my dog has the disease? 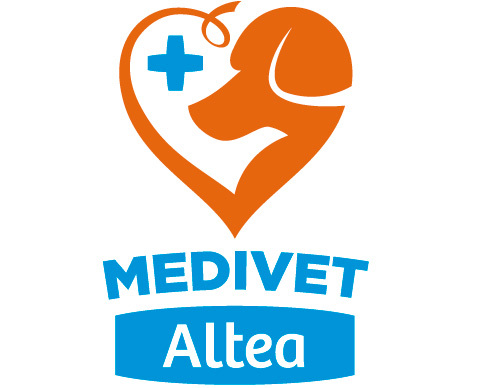 Visit your veterinarian who will do an analytical test using a blood sample from your dog. Depending on your state, will also take a sample of bone marrow or inflamed lymph node tissue for examination under a microscope and detect parasites. The incubation period can vary between 3 and 18 months. Exceptionally, the disease can remain dormant for several years. Some dogs are tough and, although receiving bites from sandflies, never show symptoms of the disease as long as they are properly fed and are not under stress. This resistance probably is genetically determined. Basically techniques that allow us to detect the parasite (parasitological) or defensive response against this ill are used. When is suspected that an animal suffers from leishmaniasis several tests are used simultaneously to ensure the diagnosis, among them we can mention sampling bone marrow or lymph node in order to visualize the parasite serology (IFI or ELISA) to control the degree of immune response the animal presents and a proteinogram. In areas endemic for leishmaniasis, dogs, routinely are monitored annually by using a rapid blood kits for early detection of possible contagion. How often have to diagnose my dog? You should take your dog to the veterinarian at least once a year. This is a time to a control treatment of symptoms and the risk of death is much lower. Can the vet treat my dog? Yes, if you observe clinical symptoms, take your dog to the vet for a serological test if you think the dog has been infested. The treatment will be more successful if it is started in the early stages of the disease. Do treatments can cure my dog? The treatment suppresses the symptoms and prevent the possibility of infection to other dogs, but not completely eliminate the parasite. Although treatment can last several weeks, the parasite remains in the dog. Until the end of the dog’s life, you have to perform regular checks to detect relapses and repeat the treatment if necessary. The leishmanicidas are drugs used for the treatment of leishmaniasis are the most used antimonials, miltefosine and allopurinol compounds. The first applied by injection and the second is taken by mouth. What is the chance of relapse? It is highly variable and difficult to quantify. 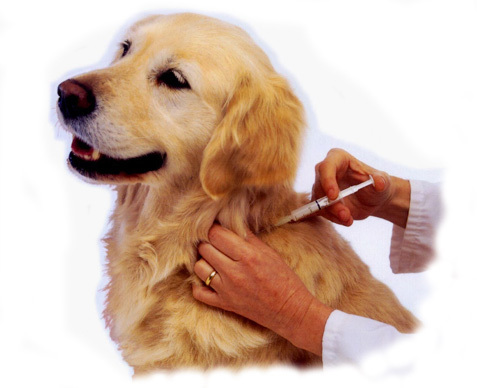 It depends on the quality of life of the dog, possible reinfection by other sandflies, the veterinary controls and so on. Is leishmaniasis controlled better if the disease is diagnosed before? The sooner the disease is diagnosed, the better you can control it. What can I do if the symptoms return? You should consult your veterinarian to monitor your pet. Can I vaccinate my dog against leishmaniasis? Yes, you can. There has been the vaccine protects against leishmaniasis in Spain for a couple of years. For more complete information about it contact your veterinarian. Are there other products that protect my dog? On the one hand, there are drugs to stimulate effective immune response to deal with infection of the parasite, for more information ask your veterinarian. On the other side, you can buy mosquito repellents, whose function is to prevent bites phlebotomo. There are products available in spray, pipetting and necklaces available at your veterinary clinic. How do these products protect my dog? The mode of action of these products mainly is a repellent effect against the bite of the transmitter (sandfly) parasite (Leishmania). A mosquito does not sting, does not transmit leishmaniasis. If no sandfly bites my dog, can I be 100% sure that he is not infected? As the only transmitter of leishmaniasis is the sandfly, we can be sure that if any infected sandfly your dog’s impossible to get sick. What else can I do to avoid getting bitten? Keep your dog indoors from dusk to dawn between the months of May and October. Use mosquito nets around the bed of your pet if he has to sleep outdoors. How many cases of leishmaniasis in humans are there in the world? Difficult to determine, it is estimated that there are 2 million new cases each year. How many cases of leishmaniasis in humans are there in Spain? There are an estimated 700 new cases each year in recent years. All of them are related to immunocompromised patients and transplant patients receiving medication to prevent rejection. What are the most common types of leishmaniasis in humans? The same types that affect the dog. In our country, Leishmania infantum. Can I receive the disease if I am bitten by a mosquito infested? It is virtually impossible that a healthy person can develop symptoms of disease. Our defensive response to infection is intense and effective, being able to prevent the expression of symptoms. In endemic areas a large percentage of the population has ever had contact with Leishmania, the number of clinical cases almost nil. The risk of developing the disease increases if the person suffers from a disease that compromises the immune system. If there are symptoms, the treatment response is very good. Are my children at higher risk of infection? Only in the case of infants or children who suffer from a disease or immune system deficiency. Is there more risk of infection having a dog at home? There are no studies on the matter, but logic leads us to believe that the risk of infection does not increase in the presence of a pet at home. In endemic areas the number of sandflies circulating is very high, and can receive bites anywhere. The risk of contracting the disease is given by living in a geographical area where the disease exists, whether or not the dog. Do I have to take special precautions to avoid disease? No, in fact if we receive any infective bite, our defensive response will prevent the development of symptoms, as previously commented except those with a disease or deficiency in their defensive system.